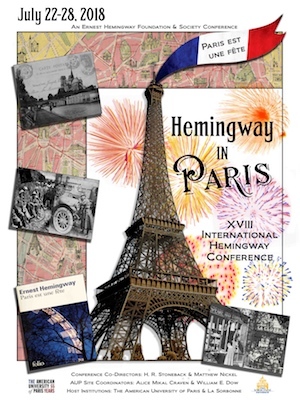 “Paris est une fête” was this year’s theme for the International Hemingway Conference in Paris—and it sure was a moveable feast for our little group that brought Misericordia across the Atlantic for great experiences, both academic and cultural. Every moment of our time in Paris brought new and exciting things (places, people, knowledge, and most importantly, food) for myself and my friends, and we are still amazed to have had the opportunity to learn in such a breathtaking place. We had the pleasure of presenting alongside scholars from places as far-flung as Edinburgh, Scotland, and Osaka, Japan, providing opportunities for meeting major literary scholars and making connections with people that we sat alongside while presenting our own papers. Taking what we had learned in our classes, we interacted with the very scholars whose critical writings on Hemingway we had read and studied, and we ourselves became contributors to the conversation. 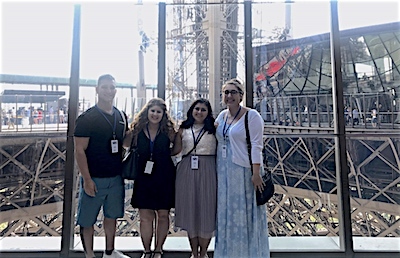 I know I never imagined myself spending my summer as an undergraduate sharing my own ideas and analysis alongside the researchers who are driving critical studies of Hemingway today, nor could I have pictured myself dining with renowned literary scholars—yet this trip was definitely a time for unexpected, exciting experiences! 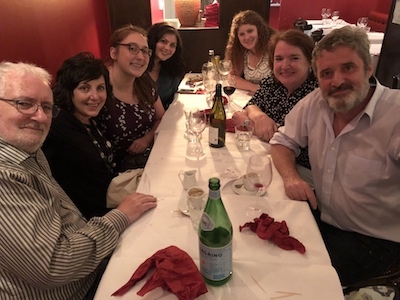 When not partaking in panels, we listened to Hemingway music and poetry in (that’s right, I said in) the Eiffel Tower, took a boat cruise down the river Seine at dusk, and traced the paths of Hemingway and his literary cohorts by visiting his Parisian haunts. My friends and I often felt as if we were dreaming because these experiences just didn’t feel real! Yet beyond the grander activities, I have to say that the best part of the trip was the opportunity to bond with my fellow Misericordia students who are friends I know I will keep forever­—I mean, once you navigate a hectic French airport and the winding streets of Paris with someone, you’re bonded for life. Though, if I’m being honest, the eclairs were a strong contender for my favorite part as well. . . So I’ll combine them and say that I most loved trying all of the delicious foods Paris has to offer with my friends! It was also a gift to have some of our professors there, as well as alumnae that we had the pleasure of getting to know over French wine in the hotel’s back garden (something that sounds so bizarre to me to say). It was such a great experience to have our cohort from Misericordia all in Paris together because it allowed us to support each other in this crazy situation and develop even stronger bonds by learning and trying new things (like escargots, because when in France. . .) together. Ultimately, I am so grateful to have come to a school and a department that allowed me to embark on such an exciting, once-in-a-lifetime journey. 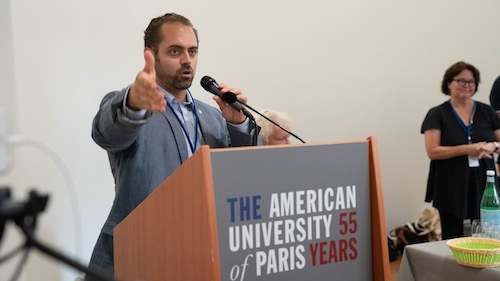 Misericordia’s English Department is full of people who will support you in every endeavor and provide you with opportunities to grow as a student and a person, and our Parisian conference is a major example of this support and encouragement. I know that myself and my fellow students—Kristen Capitano, Madison Cardinale, Scott Bargisen, Karen Reilly, Melissa Milbut, and Bailey Waltman—are eternally grateful to Dr. Nickel for encouraging us to submit papers to the conference and for teaching us so much about Hemingway that we felt confident in ourselves and our papers. 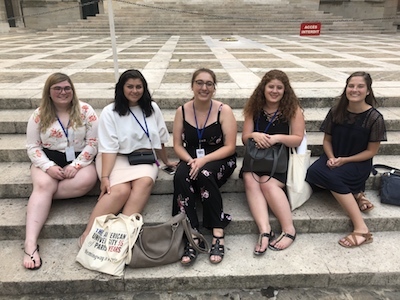 Whether sitting in a third-floor Mercy classroom reading Hemingway or sitting in a (sadly un-airconditioned) conference room in Paris presenting my paper, I absolutely love being an English major at Misericordia. 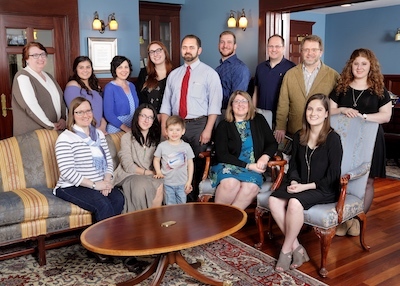 My friends and I like to refer to the English department as Misericordia’s “hidden gem” because it has such amazing professors, such great opportunities for growth in and out of the classroom, and such wonderful students in whom to find lifelong friends. Our Parisian adventure serves as a testament to just that. Briana Scorey is an English and History major in the Class of 2019 at Misericordia University. She is currently in the Honors Program, the Vice President of Sigma Tau Delta (English Honors Society), a member of Phi Alpha Theta (History Honors Society) and the History Club (served as Vice President in 2017-18), an editor for Instress, a volunteer coach for the Holy Redeemer High School Speech & Debate Team, and is a Writing Tutor with Misericordia's Student Success Center. Briana's hobbies include reading, painting, and baking. Misericordia's faculty are invested in the growth and success of each student, providing individualized attention and hands-on learning experiences.